Banks have lent a huge sum for the purchase of consumer durables during the last couple of years. The result is – Banks are now afraid of high delinquency in such Loans. The outstanding loan to the said segment dropped sharply to 82% this year which was Rs. 3,225 crore on 28th Sept 2018. 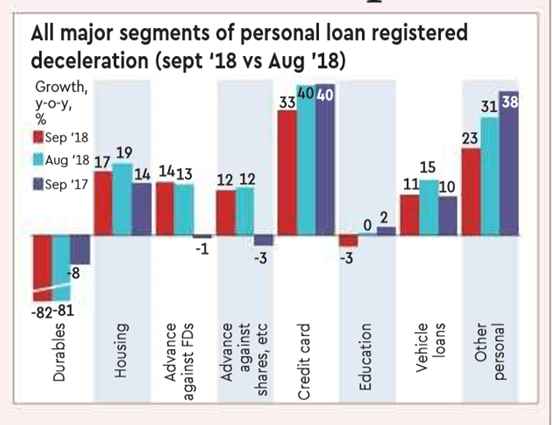 This has been otherwise taken over by NBFCs which has resulted in the exposure to NBFCs going up to 41.5% in September. An year ago the outstanding credit to this category was Rs. 17,846 crore. Banks are cautious in extending loans to individuals which is treated as personal loans by RBI. Just over 15% on an year on year basis, the growth has hit a 12 month low in September this year. Non Food items have shown an increase in their portfolio and most favoured loan is categorized to be the Home Loans portfolio within the Individuals’ loans. Loans to Consumer category and Education area are contracting. Bajaj Finance a leading player on Consumer Durables Financing has reported 44% y-o-y growth in the assets under management in Consumer B2C businsess category. Jan 2018 figures reported a third of outstanding retail loans in Banks as unsecured. Outstanding loans to individuals stood at Rs. 18.28 lakh crore of which around Rs. 5.62 crores ie., around 31% were said to be unsecured.